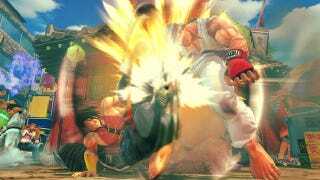 Capcom will remove the "limited offline" restrictions DRM places on the PC versions of Super Street Fighter IV: Arcade Edition, saying its community convinced it that such measures meant legitimate users would have a worse experience than the pirates the DRM means to thwart. "We've heard you loud and clear and here's what we're going to do about it," wrote Capcom executive Christian Svensson in a Capcom-Unity post titled "We Had It Wrong"
Shortly after Super Street Fighter IV: Arcade Edition launches (if not at launch), a title update will completely remove character limitations for offline mode, Svensson writes — that means all 39 characters will be playable offline. DRM, which didn't require an always-on connection but did make a periodic check-in, would have restricted users to just 15 of the game's 39 characters if they had no Internet connection. "Once you've updated, you will be able to use all 39 characters when not connected to the Internet to practice your combo timings, have some fun with a friend on a laptop, or whatever while offline," Svensson said. A Capcom representative later confirmed for Kotaku that this means access to previously downloaded DLC and saving progress in challenges or settings will also be feasible in an offline mode. "The only features inaccessible from the game when signed into a GFW Live Offline Profile are online features such as online multiplayer and replay channels," the Capcom spokesperson told Kotaku. Svensson said that the DRM, implemented via Games for Windows Live, was introduced because hackers and pirates threw the Street Fighter IV leaderboards into chaos. While Svensson lamented news reports' mentions of the DRM over "all of the great new features and thoughtful PC-specific design considerations," in SSFIV:AE, ultimately, the community's united opposition to "limited offline" play held sway. "The argument that legitimate users would have a worse experience than pirates was the loudest and most convincing," Svensson wrote. "We certainly don't want that to be the case and that was never our intention."